Christie Brinkley shared the touching story of how she and daughter Sailor Brinkley-Cook,15, helped friend and fellow veteran supermodel Iman during her fertility struggles with husband David Bowie. In a sweet Instagram post dedicated to Iman and her late husband, Christie, 61, told how – with the help of a Somalian superstition – she had a hand in helping the rock star and his supermodel wife bring their daughter Alexandria into the world. Sharing a picture of the couple from HELLO!, Christie wrote: "Iman always told the story in such a charming way... 'It took two blondes to get me pregnant: David Bowie and Christie Brinkley,'" Christie shared. "You see... Iman explained to me, In Somalia they say if you are having trouble getting pregnant you must hold a baby all day, so I handed her my baby, Sailor, and she held her all day long ...and sure enough, it worked! After 7 years trying without luck... Iman got pregnant!" She continued: "So beyond her great beauty and business savvy, and beyond Bowie's music and art, I always felt a sweet connection to this stunningly gorgeous and creative couple. Today my heart aches for Iman, and Alexandria for their untimely and unbearable loss. My deepest sympathy @the_real_iman." 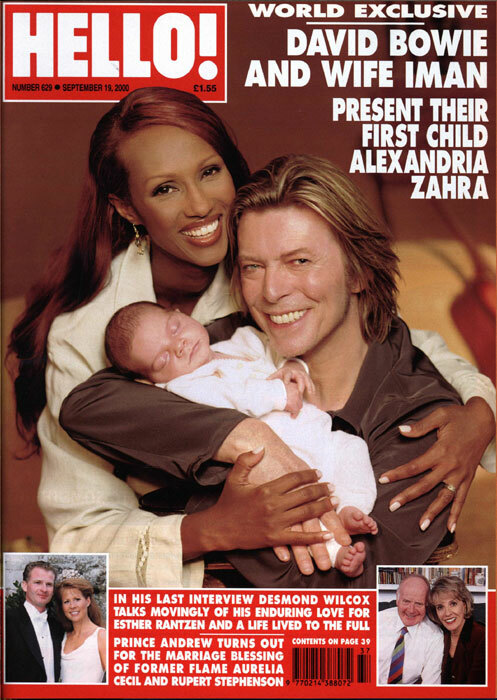 In August 2000, David and Iman introduced their little girl, known as Lexi, to the world through the pages of HELLO! for what he said would be her first and last interview. Lexi was the long awaited second-child for both parents. David was father to Duncan, his son from his first marriage, while the African beauty has a daughter named Zulekha from a previous relationship. The arrival of Lexi, Iman told HELLO!, represented "the happiest of times in my life". About the effect their new bundle of joy was already having, Iman added: "We've always been very close, but if it's possible we've been drawn even closer. There's a joy or a contentment that's almost palpable to both of us. Overnight, our lives have been enriched beyond belief." David passed away on Sunday after an 18-month battle with cancer.